It looks like Lobster is on the menu. Oops, Christine couldn't wait. Besides, she said, there wasn't enough to go around. 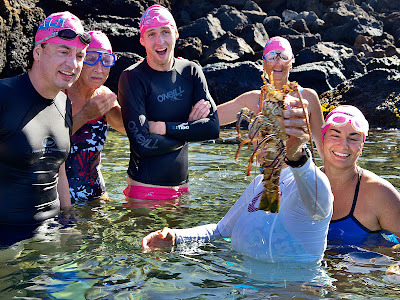 The Maui Pink Cap Swimmers can have fun and entertain themselves with anything. 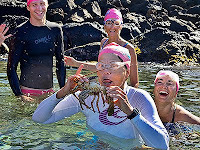 Whether it is riding a strong rip current or scaring the bubbles out of a deep-water scuba diver (very funny, Rory), we thoroughly enjoy ourselves every Sunday morning. Click HERE for more photos from this morning's ocean swim.